Atlas Stretched: What Ayn Rand, yoga, and lululemon's new shopping bags have in common. Who Is John Galt and Why Is He on Lululemon Bags? 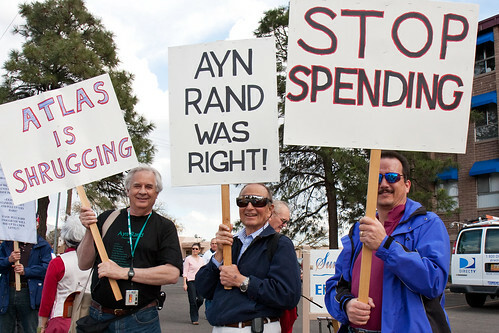 Ayn Rand groupies, yoga enthusiasts, and the American genius for self-absorption. Silly product names and a preachy website are one thing. But a couple of weeks ago, Lululemon moved beyond the usual semi-mystical yoga treacle. The company has begun printing on its signature reusable bags—those cute totes you see slung over shoulders at organic grocery stores and farmers markets across North America—the question “Who Is John Galt?” The cryptic tagline of objectivist philosopher Ayn Rand aligns with the company mission to “elevate the world from mediocrity to greatness,” according to the Lululemon blog entry announcing this unusual ad campaign. Customer reaction has been mixed, with some threatening boycotts. The average yoga enthusiast seems to have a vague idea that Rand is a darling of the right, Alan Greenspan’s fairy godmother, and a bad lady who would definitely throw your chakras out of balance. On the face of it, Ayn Rand and yoga make strange bedfellows. But upon a closer look, Rand’s radical philosophy (at least in a diluted form) is not such a bad fit in the world of American yoga, circa 2011—in fact, both movements have enjoyed smashing commercial success for some of the same reasons. We already knew that Ayn Rand was en vogue: Tea Party heroine, favorite villain of left-wing journalists who blame her for the financial crisis, the subject of a burgeoning field of Randian studies by scholars eager to plumb the strange appeal of this Russian émigré who devoted her life to turning traditional morality on its head. As a young girl, Rand fled from Bolshevik oppression to the United States and worked as a screenwriter in Hollywood before finding her calling as a dystopian novelist and critic of the socialist leviathan. In 1957 she published her magnum opus, Atlas Shrugged, an account of a totalitarian America in which the hero, John Galt, leads a merry band of industrialists, entrepreneurs, and other financial elites on strike in order to stop “the motor of the world” and show the ignorant masses and government drones just how dependent they are on the creativity and productivity of the 1 percent. The book articulated the core tenets of Rand’s philosophy, objectivism: namely, that man’s highest purpose is his own happiness, and that reason, rather than a divine power, governs the universe. Rand advocated a lifestyle of “rational egoism” and lauded free market capitalism as the only economic system that doesn’t impinge on individual rights. Wilson has pasteurized Rand’s ideals to yield the ethos of mindful self-improvement that pervades Lululemon. “We are able to control our careers, where we live, how much money we make and how we spend our days through the choices we make. … We can choose to rise up and be great,” to “conquer the epidemic of mediocrity,” explains the Lululemon blog post on John Galt. The company notes elsewhere that it “encourages” every employee to participate in a “goal setting training program,” and it emblazons the potpourri of motivational quotes that make up the Lululemon “manifesto” on some editions of its trademark bag. This bag has become a yuppie status symbol, countercultural and cliché at the same time—a wink meant to declare one’s personal philosophy to those in the know, not unlike that copy of The Fountainhead that your high school boyfriend carried around. Did you guess right? Quotes one and three come from Rand’s novels Anthem and The Fountainhead, respectively; the second quote is from Bikram Choudhury, guru of the Bikram Yoga empire. Yoga and Rand have both spawned subcultures of devotees not because Americans are either pantheistic mystics or objectivists but because they are individualists who belong to the church of self-improvement. Lululemon’s campaign is startling, but perhaps Chip Wilson is onto something, and Rand’s philosophy is only an exaggerated and especially tedious expression of Americans’ genius for self-absorption. Don’t get me wrong: I’m a yoga enthusiast who practices four times a week. But the only thing worse than a yoga teacher who makes you hold plank pose for three minutes straight is one who—like the famously humorless Rand herself—is all righteousness and no irony.